Fairbanks, Vases (MFA), no. 557.1. 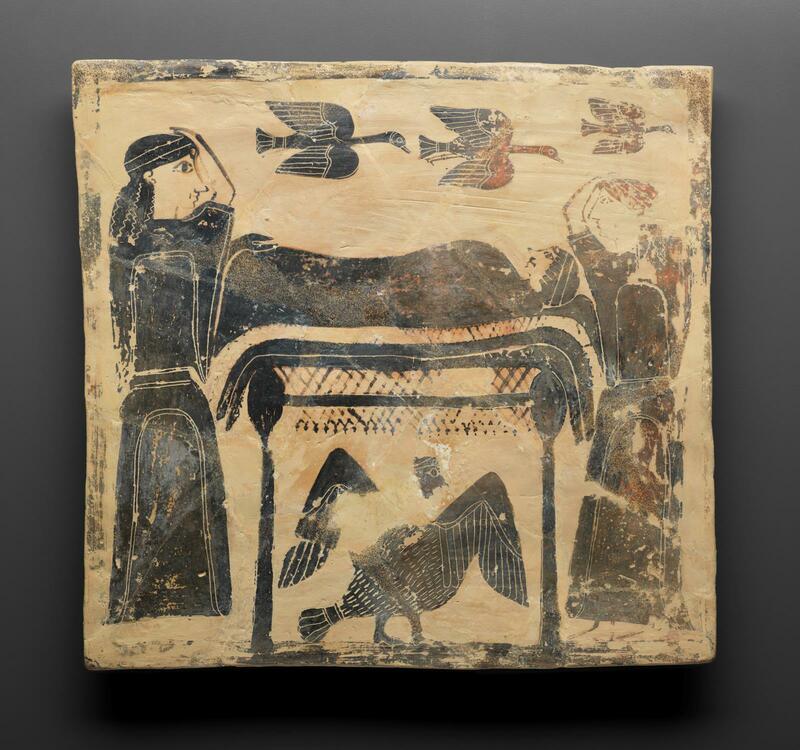 Originally part of a set that included another funerary plaque (MFA 27.147), this pinax shows the laying out of the corpse on a funeral couch – the first part of the funeral known as the prothesis¸ during which the deceased is surrounded by family. Two women are shown wearing black garments, each standing on end of the funeral couch, and they raise their hands to their heads in a gesture of mourning familiar from representations of mourning in the Greek world from the eighth century B.C. The deceased woman lies on a cushion and is wrapped in a black blanket. Three birds – geese, swans, or storks given their long necks – fly above the funeral bier towards the right, an indication of good omen or good passage. The siren beneath was a mythological winged creature with human face and feet, famous for her bewitching singing. In this case, the siren likely lends her otherworldly voice to the lament for the dead that the two mortal women sing. The style of painting has elements from the Proto-Attic style (in particular the use of outline for feet, arms, and faces), and also adopts elements of the new black-figure (which began in Athens ca. 625 B.C.) technique for the dress and hair.